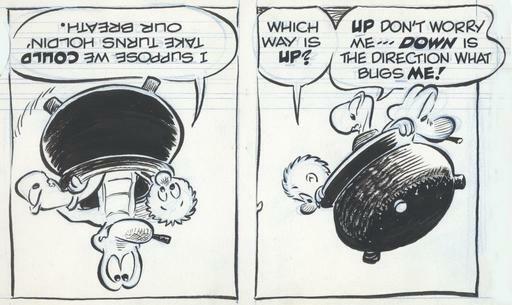 from Pogo, Walt Kelly Keeping control of the situation. This page describes the Mode 6 protocol used to get status information from a running ntpd and configure some of its behaviors on the fly. The protocol is normally used by the ntpq and ntpmon program distributed with the suite. It is fully documented here so that other clients can be written. The protocol uses UDP packets transmitted and received over port 123. They use the same structure (header, plus extension, plus optional MAC) as time synchronization messages, but the layout and semantics of the header fields are different. They are distinguished from time synchronization packets by their Mode field, which has the value 6 (110).
. Payload (variable length)                    . Requests to ntpd are single UDP packets; ntpd expects them to be padded to a 4-octet boundary. Responses may be multiple UDP packets; they may arrive out of order, and the client is responsible for reassembling the payloads. All multibyte numeric fields are interpreted as big-endian 2’s-complement integers. The maximum length of the Mode 6 payload is constrained by the minimum-maximum UDP payload size of 576. As of late 2018 there is no language in the NTP RFCs pinning it down. A draft RFC on Mode 6 says it’s 500 octets, which is far in excess of any plausible request or response size in the actual protocol. Several requests and responses (in fact, all but one) use a common textual payload format consisting of a comma-separated list of items. An item may be a textual (ASCII) variable name, or a textual variable name followed by an equals sign followed by a textual value. Following any comma the format may insert a newline; these are not significant to the meaning of the payload, but are placed so that if the payload is dumped to an 80 character terminal window the lines will be folded in a way convenient for visibility. Values may be decimal numeric literals, decimal float literals, hex numeric literals led with "0x", binary literals consisting of exactly two of digits 0 and 1, NTP date stamps, or string literals enclosed in double quotes. NTP date stamps are represented by hexadecimal fixed-point literals led with "0x", distinguished from hexadecimal integers by the embedded radix point ("."). They represent seconds (and fractional seconds) since the epoch of the current NTP era. NTP era zero began at 00:00 of January 1st 1900. String literals never contain newlines or other control characters. One quirk of the format is that a bare variable name without a following "=" may be interpreted in context as an instruction to set a string-valued variable to the empty string. Textual responses may end with padding NULs; clients should ignore these. Request-response types are distinguished by operation codes. The table below lists them all. The "Auth?" column tells whether a request requires authentication from the client. This requests ntpd to ship up a list of association IDs and status words for all peers currently associated with the ntpd instance. It does not require authentication. The normal use case for this request is to discover the current list of associations preparatory to querying peer variables for each association. There is no request payload. The response payload is not textual. It consists of a sequence of pairs, each consisting of 16-bit association ID followed by 16-bit status word, both unsigned in network (big-endian) byte order. There is no padding in the response. The number of IDs is implicitly given by the payload length in octets, divided by 4. Interpretation of the peer status word is described here. This requests ntpd to ship up a list of peer variable settings for an association specified by ID, or system variables if the ID is zero. It does not require authentication. The request payload may be empty or a textual variable list of variables to be reported in the response. An empty request payload calls for a report on all known variables. The response payload is a textual varlist. Some system variable are defined as being settable from a mode 6 client. This request provides a general way to do that. It requires authentication. The request payload is a textual list of variable settings. Any variable name that is unknown or not settable immediately terminates processing of the payload. This request is only valid with an association ID of 0. There is no response payload. No system variables are currently settable. This may change in a future release. This requests ntpd to ship up a list of peer variable settings for a reference clock association specified by ID. It does not require authentication. This request is used to change the configuration of ntpd without restarting the daemon. It requires authentication. The request payload should be a line of text in the syntax of the ntp.conf configuration file. The response payload will begin with either an error message or the string "Config Succeeded", followed by a NUL. Note: Due to an implementation error, the response packet may and typically will contain trailing garbage. Implementations should expect this and truncate it at the first NUL. This request is used to retrieve information about recent traffic between ntpd and its clients and peers; in NTP-speak this traffic summary is called the "MRU list", where MRU stands for "most recently used". It does not require authentication. A finite and variable number of entries are retrieved per request, to avoid having responses with such large numbers of packets that socket buffers are overflowed and packets lost. The entries are retrieved oldest-first, taking into account that the MRU list will be changing between each request. We can expect to see duplicate entries for addresses updated in the MRU list during the fetch operation. In the end, the client can assemble a close approximation of the MRU list at the point in time the last response was sent by ntpd. The only difference is it may be longer, containing some number of oldest entries which have since been reclaimed. If necessary, the protocol could be extended to zap those from the client snapshot at the end, but so far that doesn’t seem useful. To accommodate the changing MRU list, the starting point for requests after the first request is supplied as a series of last seen timestamps and associated addresses, the newest ones the client has received. As long as at least one of those entries hasn’t been bumped to the head of the MRU list, ntpd can pick up at that point. Otherwise, the request is failed and it is up to ntpq to back up and provide the next newest entry’s timestamps and addresses, conceivably backing up all the way to the starting point. Regurgitated nonce retrieved by the client previously using CTL_OP_REQ_NONCE, demonstrating ability to receive traffic sent to its address. Limit on datagrams (fragments) in response. Used by newer ntpq versions instead of limit= when retrieving multiple entries. Limit on MRU entries returned. One of frags= or limit= must be provided. limit=1 is a special case: Instead of fetching beginning with the supplied starting point’s newer neighbor, fetch the supplied entry, and in that case the #.last timestamp can be zero. This enables fetching a single entry by IP address. When limit is not one and frags= is provided, the fragment limit controls. (decimal) Return entries with packet count >= mincount. Return entries associated with the server’s IP address given. No port specification is needed, and any supplied is ignored. Set the reporting start point to retrieve roughly a specified number of most recent entries Roughly because the logic cannot anticipate update volume. Use this to volume-limit the response when you are monitoring something like a pool server with a very long MRU list. 0x-prefixed hex restrict bits, which must all be lit for an MRU entry to be included. Has precedence over any resany=. 0x-prefixed hex restrict bits, at least one of which must be list for an MRU entry to be included. 0x-prefixed hex l_fp timestamp of newest entry which client previously received. timestamp of 2nd newest entry client has. address of 2nd newest entry. More entries may follow; ntpq provides as many last/addr pairs as will fit in a single request packet, except for the first request in a MRU fetch operation. The response begins with a new nonce value to be used for any followup request. Following the nonce is the next newer entry than referred to by last.0 and addr.0, if the "0" entry has not been bumped to the front. If it has, the first entry returned will be the next entry newer than referred to by last.1 and addr.1, and so on. If none of the referenced entries remain unchanged, the request fails and ntpq backs up to the next earlier set of entries to resync. hex l_fp timestamp matching one of the input .last timestamps, which entry now precedes the response 0. entry in the MRU list. text of address corresponding to older.last. The client should accept the values in any order, and ignore .# values which it does not understand, to allow a smooth path to future changes without requiring a new opcode. To ensure this, ntpd occasionally issues a randomly-generated tag=value pair. All such noise tags are three letters long. Clients can rely on all *.0 values preceding any *.1 values, that is all values for a given index number are together in the response. 0x-prefixed l_fp timestamp at the server marking the end of the operation. hex l_fp identical to last.# of the prior entry. Portions of the response side of the protocol (specifically the last.older, addr.older, and last.newest attributes) can be ignored by a client that is willing to accumulate an entire set of MRU list fragments and then perform stale-record elimination of its own before displaying or passing on the report (that is, as opposed to incremental display with an attempt to suppress stale records on the fly). This request is used for two purposes: to retrieve restriction lists and to retrieve interface statistics. For the former use, the request payload should be the string "addr_restrictions"; for the latter case, the request payload should be "ifstats" or empty. Both uses require authentication. The response payload is, in both cases, a textual varlist. A response payload consists of a list of attribute stanzas. Each stanza consists of the attributes with tags of the form "name.#', with # being replaced by a zero-origin integer literal that is the index of the stanza. Attributes within each stanza are deliberately issued in a random order, and ntpd occasionally issues an attribute with a randomly-generated name and value. This is an attempt to prevent Mode 6 clients from making brittle assumptions about the inventory of attributes and their transmission order. Space-separated list of flag names applying to the address. These flag names are the same as those used in the "restrict" directive of the configuration syntax. The number of times this rule has been matched. Not updated for default rules. Subnet mask qualifying the address to express a range. Address of the interface. May be IPV4 or IPV6. Has a port suffix. May be a wildcard; extreme cases are 0.0.0.0 and [::]. Either a broadcast address associated with the interface or empty. Integer literal. 1 if packets on this interface are processed, 0 if they are to be ignored. A hex literal that is a mask of flag bits on. Flag mask values are described in a following table. The interface name, such as would occur in an ifconfig listing. Count of peers using this interface. Last time-to-live specified on a send. This request is used to initialize an MRU-list conversation. It informs ntpd that the Mode 6 client is ready to receive. It does not require authentication. The request retrieves a nonce specific to this client, which will be played back to ntpd to demonstrate that the client is capable of receiving responses at the source IP address that requested the nonce, and is thereby unlikely to be forging the source address. This check prevents CTL_OP_READ_MRU from being used for flooding attacks. The request has no payload. The response will be a textual varlist containing one string-valued variable, "nonce". The value need not by interpreted by the client, only replayed as part of a following MRU-list request. Each nonce becomes invalid 16 seconds after the request for it was received by ntpd. While the issue time is encoded in the nonce, it is safer practice not to rely on the nonce format but instead to track the last nonce transmission time in your client and re-request based on that. Authenticated requests require a MAC (message authentication code) trailer following the payload data, if any. Such requests must be padded to an 8-octet boundary, with those bytes not included in the header count field. The 32-bit identifier of the signing key in network byte order. 2a. In digest mode, a cryptographic hash of the following octet spans, in order. First, the password entered to use the signing key, then the request header fields, then the payload. 2b. In CMAC mode, a cryptographic hash of the packet header and payload with the crypto algorithim using the key. The cryptographic hash is 16 octets for MD5 ir AES-CMAC and AES and 20 octets for SHA-1. Longer digests are truncated. The key length for AES is 16 bytes. Longer keys are truncated. Shorter keys are padded with 0s. MD5 and SHA-1 can use any key length. The "recent" parameter of CTL_OP_READ_MRU is not supported in versions prior to NTPsec 0.9.6. Export of the count of control requests (ss_numctlreq) is new in NTPsec.